Have you ever wondered how electric car sharing works? How do you book a car or unlock it? You will soon have the chance to experience it as GoTo launches Malta’s first electric car sharing service during Notte Bianca in Valletta. Valletta is Europe’s 2018 capital of culture, so we thought it would be fitting to introduce our new car sharing service on Notte Bianca – one of Malta’s most important and busiest cultural calendar events. Car sharing is fast becoming a popular mode of transport in cities around the world, and during Notte Bianca, you will have the chance to be one of the first to try this in Malta. On the 6th of October, at Notte Bianca, you will be able to try the GoTo car service for free! Notte Bianca is so popular that getting from one end of Valletta to the other on foot can prove to be challenging. This is where GoTo cars are going to help you take charge of your Notte Bianca experience. Never driven an electric vehicle before? Not to worry. The GoTo team will be on hand to show you how to operate an electric vehicle, so you get a free lesson thrown into the package. We will explain how the car sharing service will work, meaning that you will be one of the car sharing pioneers in Malta! You will be able to use a GoTo car free of charge by picking one up at Castille street (near the Malta Stock Exchange) or near Fort St Elmo. GoTo is an official partner of Notte Bianca, and a pre-planned route will be in place to help you get from one side of Valletta to the other. Many people don’t get to see everything at Notte Bianca because they tire themselves out, walking down to the bottom and then back up to the top. This will not be a problem this year. By using a GoTo car, you will be able to drive down to St. Elmo and enjoy the attractions in the lower half of Valletta. You can then drive back up to Castille street to experience the event on the other side of the city. Because GoTo cars provide a point-to-point service, if you decided to walk back up (or down), you are free to do so. This occasion will mark a step towards the release of the GoTo car sharing service all over the Maltese islands. 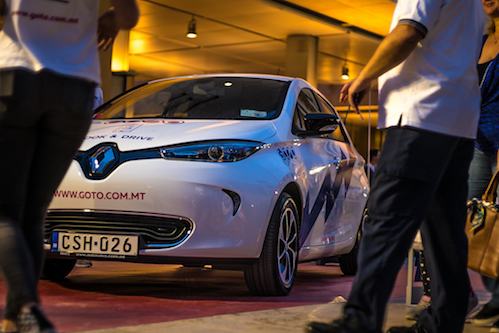 Soon, you will be able to access 150 electric cars all over Malta and Gozo. GoTo cars will be self-driven by members, who will be able to pick up any vehicle from over 450 designated car-spaces and drive it at a charge of €0.28 per minute when buying a Standard Plan. GoTo rates will include fuel, insurance and also Valletta CVA fees. GoTo wants to be part of the solution to Malta’s traffic and environmental problems, and we would love you to join us on our journey. Come and meet us during Notte Bianca on Saturday, 6th of October.